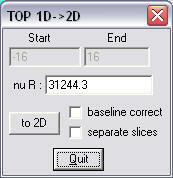 Download the TOP example files [Download] and extract the zip file to a directory of you choice. Load the "YAG 300 001 BL.1R" 1D file [Menu/File/Open. 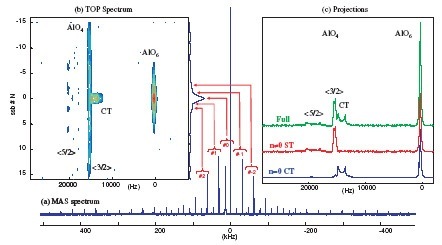 The 1D files shows multiple spinning sidebands arising from the satellite transitions of AlO6 and AlO4 contributions. Load the default decomposition parameters [Menu/Decomposition/Load Fit]. This decomposition file only contains a fit of the <+/-3/2> spinning sidebands allowing an exact measurement of the spinning rate (31244.29Hz). You should now have a 2D spectrum looking like this (after rescaling with [Menu/Graph/Parameters change "level div" to 1.9]. + the AlO4 second order broadened central transition, only showing up in the central slice (N=0) with its <+-3/2> transition on the left side (sharp ridge) and even some contributions of the <+-5/2> transitions. Go to the left panel button and select "ssb" from the projection list ("no proj" by default) and build the projection again [Menu/Tools/TOP/Proj N#0] and obtain the spectra of the satellite transitions alone (by ignoring the N=0 central transition).